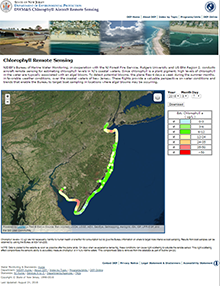 The purpose of NJDEP's Bureau of Marine Water Monitoring's (BMWM) Algal Bloom Monitoring Program is to ensure safe shellfish harvest by avoiding contaminated Harmful Algal Bloom Harmful algal blooms (HAB) in marine waters are mostly caused by a small subset of single celled algae called phytoplankton. The effects of these algal toxins can range from neurological impairment, gastrointestinal distress, respiratory irritations, and in some cases death. Click inside popup to close it. producing bio toxins. HAB's represent a small subset of phytoplankton species that negatively affect human, animal, and ecosystem health. As part of the State's compliance with the National Shellfish Sanitation Program (NSSP), NJ is required to develop a BioToxin Contingency Plan that includes control measures for marine biotoxins. For more details on HABs, see our Marine Harmful Algal Bloom fact sheet. To protect against HABs and to comply with the NSSP, BMWM manages the two programs below. Since chlorophyll is a plant pigment, high levels of chlorophyll in the water are typically associated with an algal bloom. To detect potential blooms, an airplane equipped with a remote sensor flies 6 days a week during clear, summer weather conditions over coastal NJ. These flights produce estimated chlorophyll �a� concentrations that are made available for viewing through an interactive map. Developing algal blooms are monitored through this tool and Marine Water Monitoring will strategically deploy field staff to locations of concern. Samples are collected and brought back to the bureau laboratory for analysis to determine if a HAB species is present. 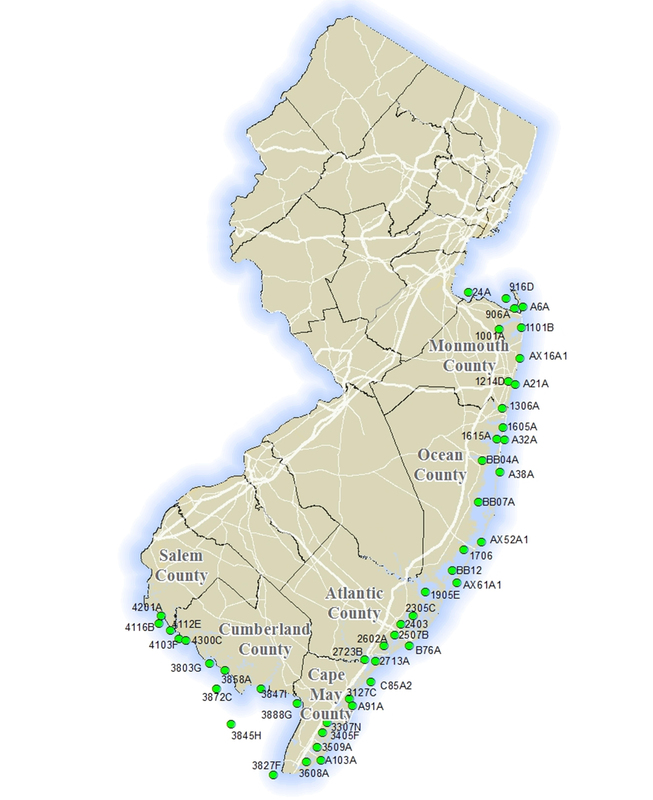 Through air craft remote sensing, BMWM is able to monitor an expansive area of NJ�s coastline for potential algal blooms. Since monitoring is performed from the air, access to waters along the coast are never an issue. Management can monitor the day to day sensor results to determine if a potential algal bloom is beginning to develop and in which part of the state. High Chlorophyll 'a' values can potentially indicate the presence of a Harmful Algal Bloom (HAB). 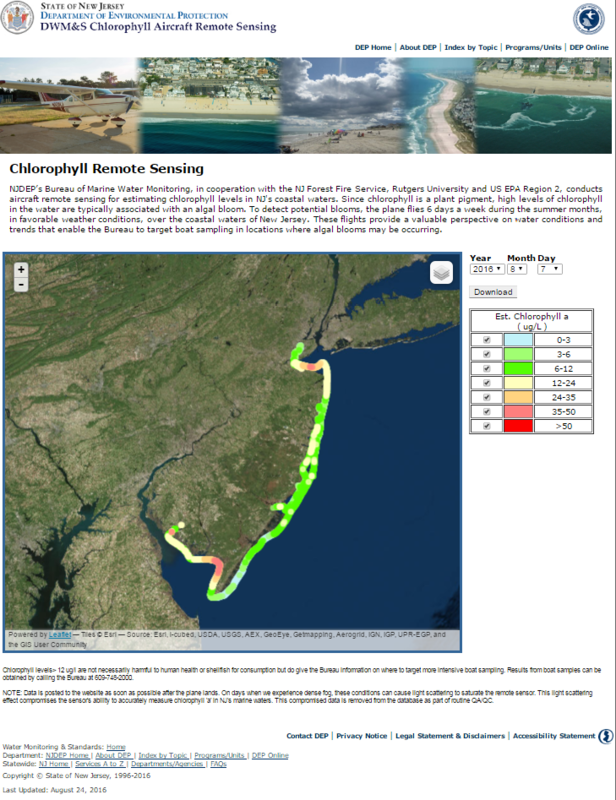 If the remote sensor indicates elevated Chlorophyll 'a' levels, NJDEP will strategically deploy staff to the observed areas of high concentration to collect samples. The samples are analyzed at the Leeds Point laboratory to determine if a HAB species is occurring. chlorophyll �a� concentrations. Once setup is complete, minimal costs are required to operate and maintain the system throughout the year. Our Remote Sensing Program could not be done without the cooperation of the NJ Forest Fire Service, Rutgers University, and USEPA Region 2. The phytoplankton-monitoring program provides surveillance of shellfish growing areas for possible toxin-producing algal species. A station network of over 45 sites are monitored for chlorophyll �a� multiple times throughout the year. In addition, these samples are being closely evaluated to determine if concentration of any toxic algal species are present and at an unsafe level. Unlike the bureau�s Air Craft Remote Sensing Program, collection of a water quality sample isn't driven by identifying high concentrations of chlorophyll which may be associated with algal blooms. Instead, this program collects water samples at a fixed site regardless of prior information. Over 45 fixed stations are visited multiple times during the year. Samples are collected and brought back to the Leeds Point laboratory facility to determine if any Harmful Algal Bloom (HAB) species are present. To help with identification of Harmful Algal Blooms (HAB), the bureau collects water samples year round throughout the coastal waters of NJ. BMWM has integrated the monitoring of Harmful Algal Blooms (HAB) into its routine National Shellfish Sanitation Program (NSSP) network. This optimizes both the temporal and spatial frequency when monitoring for potential HAB development. To download the Phytoplankton QAPP, click here. Besides being potentially toxic to humans through shellfish consumption, algal blooms may have other harmful effects including marine fauna kills, mild toxicity to bathers and reduced aesthetic quality. If you have observed discolored coastal water within the past week, note the location (longitude & latitude if possible), date and time that you made the observation, and general description of the location. You can then contact the NJDEP Hotline at 1-877-WARN-DEP. In addition, you may also contact us with concerns and additional information. For more information related to HABs, you can visit the Division of Water Monitoring & Standards (DWM&S) and Bureau of Freshwater & Biological Monitoring HAB pages.